Eat better and live healthier with this easy-to-follow Ayurvedic cookbook. Warm, comfort foods like Shepherd's pie or butternut soup can help alleviate joint pain and poor circulation brought on by chilly, windy weather. In summer, pasta primavera, shrimp salad, sauteed tofu, and other sweet and light foods cool off irritable moods and help digestive problems. Pungent, astringent foods--savory lentils, turkey loaf, kasha and the like --can help ease the distress of a winter cold. The Quick & Easy Ayurvedic Cookbook allows you to implement Ayurvedic principles in your cooking easily and improve your health without devoting long hours of study to the subject or breaking your budget. Learn how to cure insomnia and indigestion, and even mood swings, just by making food choices based on your Ayurvedic constitution. The recipes include familiar favorites making this cookbook a practical addition to your kitchen and home. While studying philosophy in college, Eileen Keavy Smith became interested in Eastern philosophy and religions, meditation, and yoga. She went on to earn a Master's Degree in library and information studies and has been a librarian for over 30 years, during which time she has spent most of her career managing libraries that specialize in health subjects and working with colleagues who are health professionals. In the late 1980s, Smith attended a meditation conference, where she was introduced to the concept of Ayurveda--the ancient Indian system of holistic health care. She has been studying the subject and applying it to her life ever since. 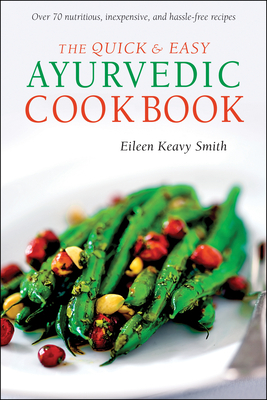 The Quick & Easy Ayurvedic Cookbook is the result of Smith's strong interest in nutrition and cooking and her desire to share insights about how to apply this healthful Eastern philosophy to modern lifestyles and tastes. Smith lives in Tallahassee, Florida with her husband Rob (who teaches meditation in his spare time) and their three canine companions.